Here's something fun and exciting for the baby shower from the hostess with the "mostess". It's our Keepsake Autograph Doll and eight Terry-ific Cupcakes. The Autograph Doll is great to pass around at the party for everyone to write their sweet sentiments to the expectant new mother. After the shower the Doll becomes a fabulous wall decoration for baby's room and a wonderful rememberance of the special day. 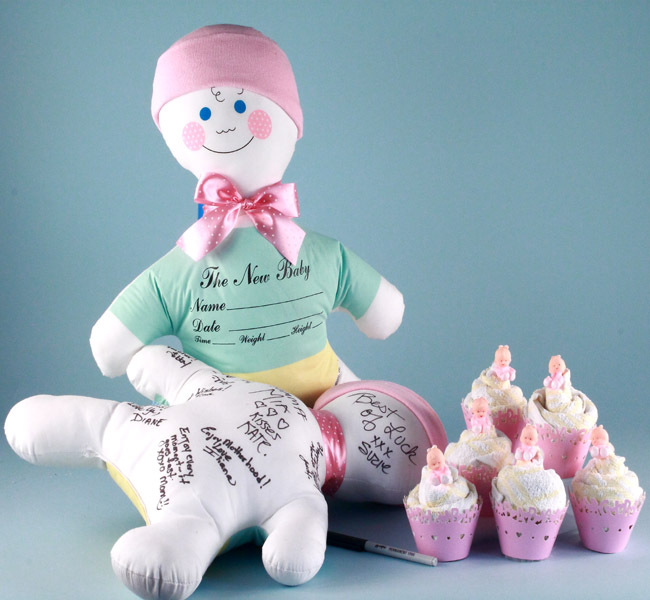 The Autograph Doll comes with a permanent fabric marker and a 100% cotton cap for baby. The eight delicious looking Cupcakes make fantastic and practical party prizes or give-aways as each is made from a terry kitchen towel. Additional Cupcakes can be ordered as baby shower favors by clicking Cupcakes.